This week’s Ironman statistics come from Frankfurt where the European Ironman Championship was held over the weekend. 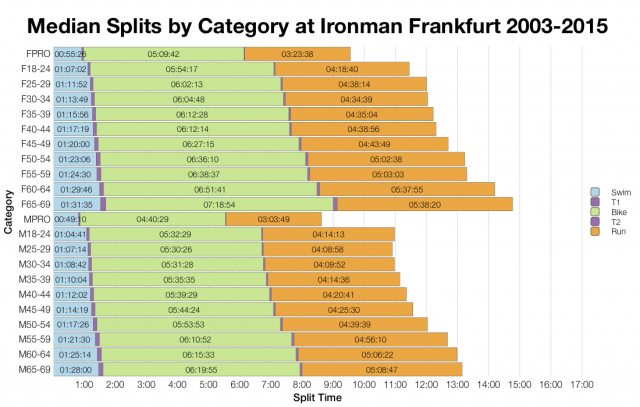 Ironman Frankfurt is a competitive event, a regional championship, attracting a large pro and age grouper field. Seventy-five Kona slots are on offer to the fastest age groupers on the day, but claiming one is no easier matter. 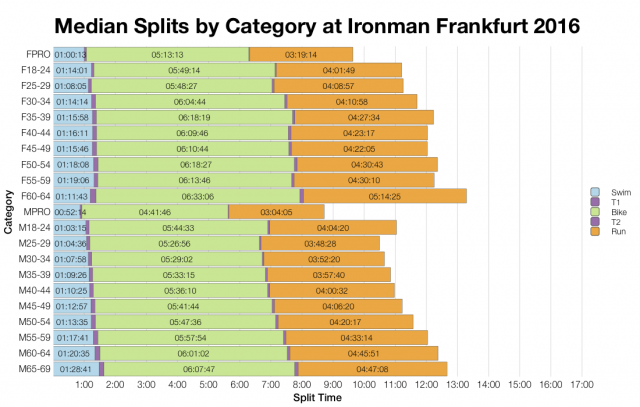 Frankfurt is a fast race. 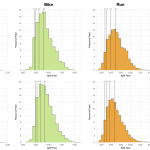 This year’s race is no exception – times are as fast or faster than the aggregated distribution for the last 10 years. The run in particular trends much faster than we usually see for Frankfurt and results in faster finishing times for this year’s race. 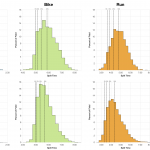 The biggest change is seen in the middle of the pack, but front of pack athletes are faster than usual too. The DNF/DNS rate for this year’s race is also a little lower than usual. It’s a sharp contrast to 2015 where hot conditions resulted in a huge number of run DNFs; in comparison 2016 looks to have been ideal race conditions. Both DNF rates and results distributions suggests this was a favourable year. 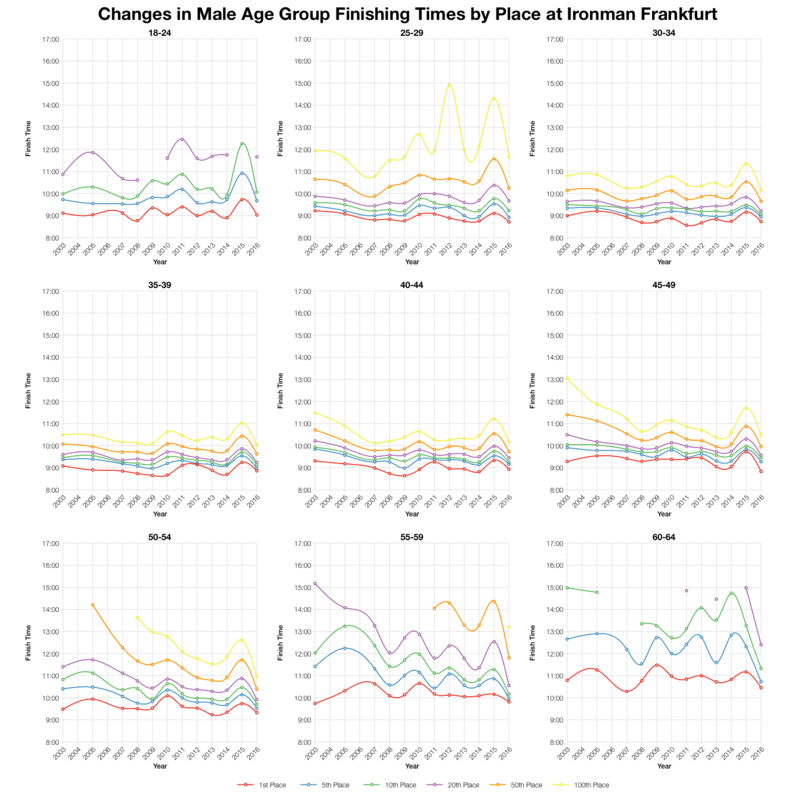 Naturally median splits trend faster at this year’s race. 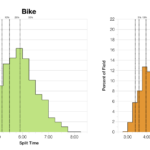 It’s not apparent with the swim medians, but otherwise both bike and run splits are quite consistently faster. The opposite is true for the Pro field where median times trend a little slower than before. Not much to note here until I start adding in Kona qualification data, but as with other European races we see a broad spread of nationalities. Following variations in Finishing times over the last decade-plus of racing suggests that this year’s race is among the fastest. 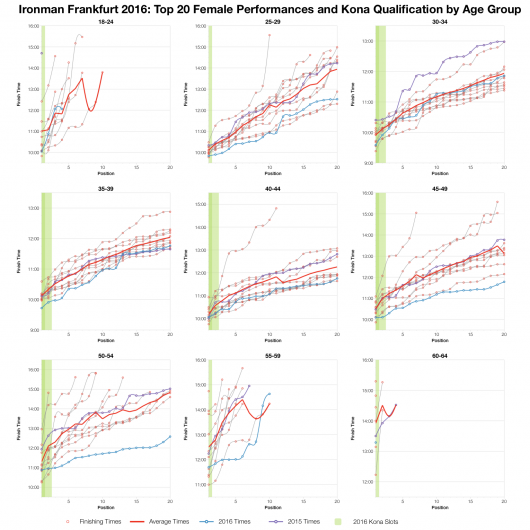 As there’s variation with age group and position it’s impossible to choose a definitive fastest race, it depends on your perspective, but we can see that this year’s results are frequently in the top three. Based on calculations for the allocation of Kona slots I’ve estimated the automatic qualifying times at this race (actual allocation and times depend on exact start numbers). As mentioned this is a fast race with many male age groups needing to break 9 hours to qualify and female age groups needing to break 10. 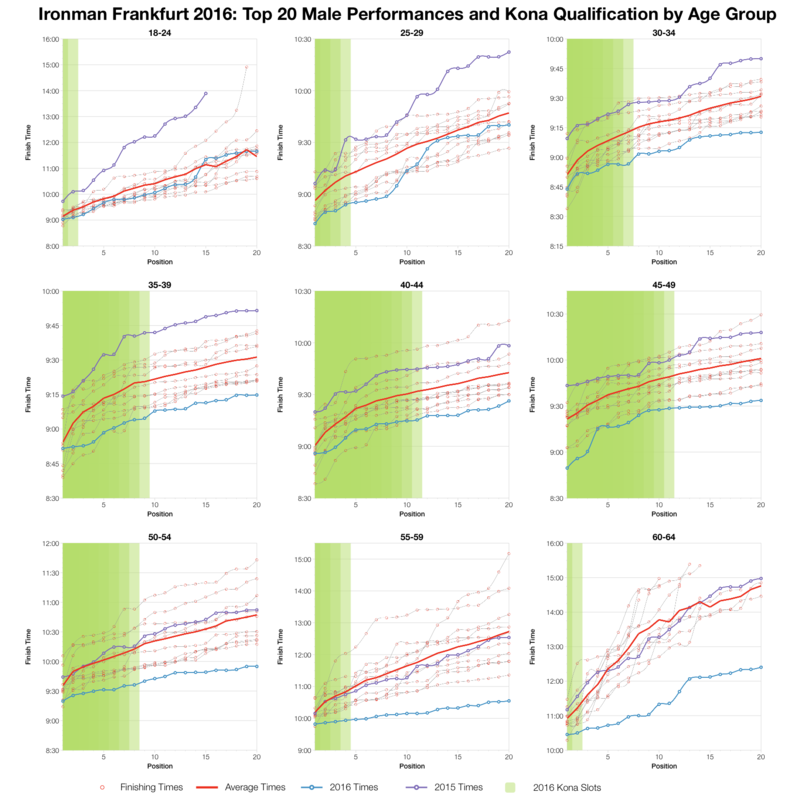 For comparison with other races and past qualifying data for Frankfurt visit my Kona Qualification page. 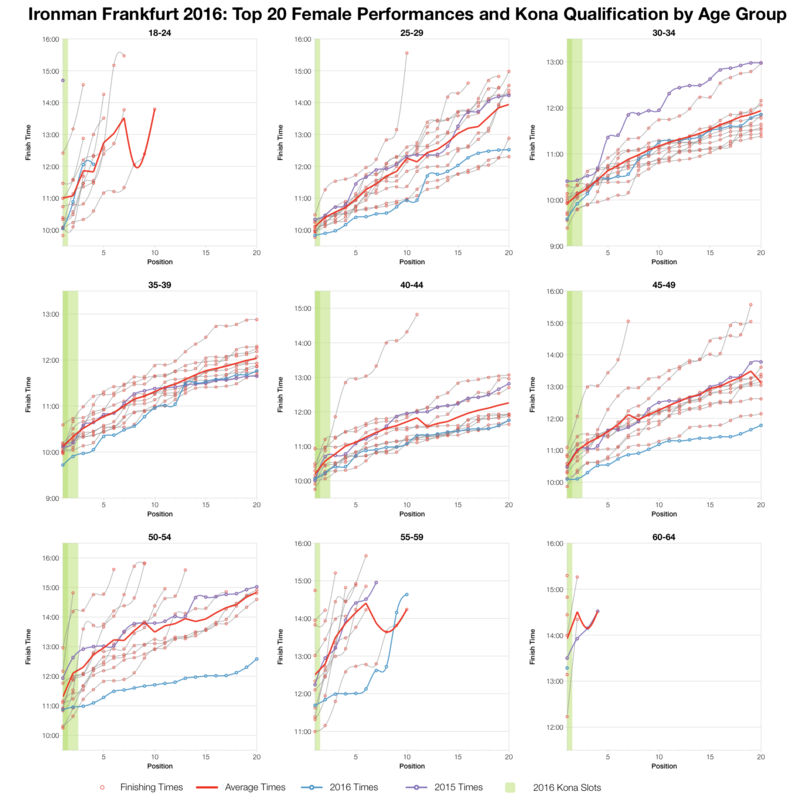 It’s fair to say that this year’s top twenty age group times fall well ahead of the average. In many cases we see some of the fastest top twenty times for this race. The contrast with 2015 results is very apparent – last year’s race saw some of the slowest top twenty times for the event. Here we have a challenging year to try to qualify with some very fast racing from the front age groupers. You can access a spreadsheet of the full results and splits for Ironman Frankfurt 2016 on my Google Drive.